For better or worse, Switzerland still exists as such, although Swiss punk bands didn’t exist in 1969, nor would a referendum to limit CEO’s salaries to 12 times their lowest-paid employees’, or another referendum to provide everyone with a universal monthly income, have existed in 1969 (or make it on the ballot in the US or Canada in 2014–Vermont, maybe). Swiss hockey also didn’t exist in 1969, or 1979, or 1989, or, effectively, 1999, at least as it translated to players who ended up in the NHL. Defenseman Mark Hardy was the first Swiss NHLer, making his debut for a 1979-80 LA Kings team that went 30-36-14 and finished second in the Norris Division (ah, 70s/80s hockey), tallying a lone assist in 15 games. Along with Larry Murphy, Jerry Korab, and future Flyer Jay Wells, Hardy helped improve the Kings’ goals-against by 23 the following season as they improved to 43-24-13, still only good enough for second in the Norris, four points behind the Canadiens (yes, Montreal, Hartford, Pittsburgh, and Detroit were in the same division as Los Angeles– again, it was 70s/80s hockey, before geography really existed). The Kings still however lost in the first round of the playoffs to a New York team, this time the Rangers rather than the Islanders. It would be the Kings’ best regular season until Wayne Gretzky came to town, although the 1981-82 playoffs would witness the Miracle on Manchester (Hardy assisted on Steve Bozek’s game-tying goal in that memorable Game 3). Hardy’s career season was 1984-85, when he scored 14 goals and 39 assists for a Kings team that missed the playoffs with the second-worst record in the NHL (only Detroit was worse). The Kings traded him to the Rangers in February 1988 for Ron Duguay, best known for his hair, his supermodel girlfriends, and his appearances at Studio 54. Hardy spent the next five seasons with the Rangers, briefly becoming a North Star before the Rangers reacquired him a few months later. Hardy then became a King again in March 1993, traded along with a draft pick for John McIntyre (who as a Canuck would start Game 7 against the Rangers in the 1994 Stanley Cup Finals, centering Shawn Antoski and Tim Hunter–somehow, Vancouver lost that game). Upon retirement as a player in 1993-94, a season after the Kings’ first finals appearance, he became an assistant coach for the Blackhawks and Kings for several years, was then charged with sexual abuse and subsequently treated for alcohol rehabilitation, and re-emerged as a coach in the ECHL. Ironically, Hardy is Swiss for the same reason Kobe Bryant speaks Italian: Hardy was born in Samedan, Graubünden when his father was playing professional hockey in Switzerland before moving back to Canada. Hardy even played for Team Canada at the 1986 World Championships. The first Swiss NHLer? Hard(l)y.
Paul DiPietro: The opposite of Hardy, DiPietro was born in Canada but moved to Switzerland after former Rapperswil-Jona Laker Doug Gilmour suggested the former Montreal Canadiens 1992-93 playoff hero join a Swiss team when his NHL career appeared over. DiPietro ended up marrying a Swiss woman, becoming a Swiss citizen, and defeating Canada as a Swiss Olympian. Nino Niederreiter: The fifth overall pick in the 2010 draft, Nino was actually born in Switzerland (Chur) and despite a rough rookie season as an Islander in 2011-2012 (a single goal and no assists in 55 games, averaging 10-plus minutes of ice time) and no NHL time last season, is already averaging a point every two games with the Wild this season at age 21 and taking regular shifts on the top scoring lines. Mark Streit: Arguably the best Swiss NHLer ever, Bern’s Streit holds the Swiss single-season scoring record (13 goals, 49 assists for the 2007-8 Canadiens) and is 60 points away from tying Hardy for the most total points. His 10 power-play goals for the 2008-9 Islanders are also a Swiss single-season high. As an Islander, he became the second-highest-paid Swiss professional athlete (some guy named Federer) as well as the first Swiss NHL team captain. I probably saw him playing for the ZSC Lions in March 2003, prior to Montreal drafting him with the 262nd overall pick the following year. The Flyers acquired him from the Islanders for Valencia, CA’s Shane Harper and a 4th round pick. Jonas Hiller: Former Swiss goalie of the year and two-time Spengler Cup winner, Anaheim’s Hiller leads all Swiss goalies in career wins (152 and counting), shutouts (18), playoff wins (10), and games played (304 and counting). He finished 9th in Vezina Trophy voting last season. Sven Baertschi: First round pick Baertschi (a.k.a. Bärtschi) was playing his first full NHL season, typically lining up with Mikael Backlund and Jiri Hudler, prior to being reassigned to the AHL in mid-December. He’ll be back. Damien Brunner: Brunner opted to sign with Detroit as a free agent out of Zug, scoring 12 goals in the regular season and five more in the playoffs (including an overtime game-winner against Hiller). A UFA, he signed a two-year deal with the Devils (as it were), where he’s currently sidelined with a knee injury. Yannick Weber: There is no other worthy second-team forward, so Weber, a seventh defenseman-swingman type who frequently played fourth-line forward over parts of five seasons between the minors and the NHL with Montreal prior to signing with the Canucks this past off-season, will have to do. Roman Josi: It’s true that the Predators’ second-best defenseman is automatically whoever plays with Shea Weber, but Swiss Olympian and 2013 IIHF World Championship MVP Josi is a decent NHLer on his own terms. Luca Sbisa: Born in Sardinia, Italy, ex-Flyer first round pick Sbisa is in fact Swiss, having moved to Oberägeri, Zug when he was one. The Flyers traded him to the Ducks in 2009 along with Joffrey Lupul and two first round picks for Chris Pronger and Ryan Dingle. He was a Swiss Olympian in 2010. 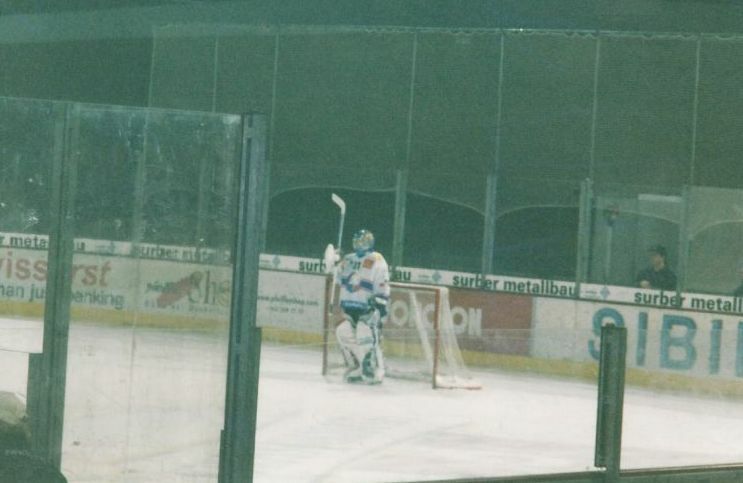 David Aebischer: The Fribourg-born Aebischer won a Stanley Cup his rookie year with the Avalanche; however, he only played a single minute of playoff games backing up Patrick Roy (16-7, .934, 1.70). Aebischer won 106 games, including 13 shutouts, in an 8-year NHL career with the Avalanche, Canadiens, and a single game with the Coyotes. His best season was 2003-4, during which he went 32-19-9, .924, 2.09 with 4 shutouts in the regular season for Colorado and 6-5, .922, 2.08 in the playoffs, losing to the Sharks in the semifinals. He was traded to Montreal for former Vezina and Hart Trophy winner José Théodore in 2006. G Martin Gerber: He won 38 games in the regular season for the 2005-6 Carolina Hurricanes but was benched after a 6-1 Game 1 loss and a 6-5 Game 2 double overtime loss to the Canadiens. Rookie Cam Ward took over and went 15-8, .920, 2.14 the rest of the way. (Gerber did win Game 4 of the conference finals against Buffalo, 4-0, but was then benched after another rough start in Game 5.) Gerber then signed as a free agent with Ottawa to replace the departed Dominik Hasek, who had signed with Detroit. He lasted for two-plus seasons and one bad playoffs (a sweep by the Penguins) before the Senators waived him and Toronto claimed him to finish the 2008-9 season and, effectively, his NHL career (less three games with Edmonton in 2010-11 as an AHL recall because of injuries). He’s still the third-best Swiss NHL goalie ever. It didnt take the Oilers long to realize there was a reason no team had ever drafted a guy from Switzerland in the first round before Edmonton. Dubbed the Swiss Miss (kids can be so cruel), Riesen lived up to the passive, timid stereotype. He played 12 lifeless games with the Oilers before realizing that some opponents play too rough and running home to the comfort and safety of the Swiss League. Many other Swiss have been drafted but never made the NHL–given how many Satan jerseys the Sabres sold based on name alone, one can only imagine how many Cunti jerseys the Lightning could have sold–but by now, who can blame anyone for being sick of the Swiss? This entry was posted on January 5, 2014 at 7:13 pm and is filed under Canucks-related, Flyers-related. You can follow any responses to this entry through the RSS 2.0 feed. You can leave a response, or trackback from your own site.